You can use a variable in your data flow to represent a value in a transformation. For process flows, variables are typically used in stored procedures or to control the flow. The following types of variables can be used in a flow. DataMigrator variables are supplied with the DMC. System variables are supplied with the DMC. User-defined variables are created by a user. Note: You can set a value for a variable in the set variables objects on the process flow tab. You can also specify run-time parameters directly from a batch file, shell script, or JCL. For information on setting values when executing flows from CMASAP or CMRUN, see Event-Based Scheduling. Statistical and Control variables can be referenced in stored procedures. They are primarily used in process flows. Is the user ID that originally saved the flow. Note: &&CM__AUTHOR is the user ID that originally saved the flow, which is not always the userid that ran the flow. To find the user ID that ran the flow, assign a value of GETUSER('A32') to a variable in the set variables object on the process flow tab. Is the name of the flow. Is the name of the target table for the data flow. Note that for flows with multiple target tables, the variable CM__TARGET has a number appended to the name. Control variables are typically used in process flows. Shuts down all flow processing if the value is set to Y. The flow immediately branches to the end of its logic, skipping all code that follows the stored procedure where this setting is used. Any data flows or procedures are not executed. This may be useful in cases where a site-dependent variable (program result, special file allocation, and so on) fails, and the entire extract is to be stopped. The default is N.
To reset, assign a value of 'Y" to the global variable KILL_RPC in a set variables object on the process flow tab. System variables are identified by a single ampersand and an alphanumeric name, up to ten characters long. These variables can be referenced in stored procedures. Each date shown below represents May 25, 2005. Is the current date (MM/DD/YY) as a character string (A8). Is the current date (DD/MM/YY) as a character string (A8). Is the current four-digit year date (DD/MM/CCYY) as a character string (A10). Is the current four-digit year date (MM/DD/CCYY) as a character string (A10). Is the current date (YY/MM/DD) as a character string (A8). Is the current four-digit year date (CCYY/MM/DD) as a character string (A10). Is the current date as day, month, year. Useful for numerical comparisons. Is the current date as day, month, with a four-digit year. Is the current date as month, day, year. Is the current date as month, day, with a four-digit year. Is the current date as year, month, day. Is the current date as a four-digit year, month, day. DataMigrator supports the following statistical variables that can be referenced in stored procedures. Statistical variables are recorded up to a value of 2,147,483,647. They are primarily used in process flows. Is the number of transactions accepted. Is the number of rows updated. Is the number of rows rejected due to database constraint violations, or for flat file targets due to a format error. Is the number of rows deleted. Is the number of rows rejected as a result of duplicate values in the data source. Is return code value from the execution of an operating system command. Is the number of rows rejected as a result of a format error, or when a field is truncated. Is the number of rows added to the data source. Is the number of rows rejected as a result of an invalid condition. Is the number of rows rejected as a result of not matching a value in the data source. Is the number of rows rejected for reasons other than the ones specifically tracked by other statistical variables. Is the number of rows processed. Is the number lines returned in the last answer set. Is the number of records retrieved in last answer set. From a calculator, select the Columns/Variables tab. Note: The variables are grouped by category. To view all variables, right-click in the variables workspace and select View Alphabetical. Double-click a variable to add it to an expression or condition. You can also type in the name of the variable. DataMigrator and System variables must be enclosed in single quotation marks (‘). Note: Match the format (alphanumeric or numeric) to the system variable in a Source or Target Transformation. &TOD and system variables that start with &DATE are alphanumeric. All others are numeric. When the expression is complete, click OK. The variable appears in the Expression column in the Transformations window, as shown in the following page. The Variables tab is also available in the SQL and Filter calculators. Variables that are used as parameters are called local variables and are identified within a flow by a single ampersand and an alphanumeric name, up to ten characters long. Local variables can be used throughout the flow, for example, in transformations or filters. In order to use a local variable it must have a value. Establishing local variables when designing a flow. If a flow contains a local variable and you run any test, you will be prompted to enter a value for the variable. Setting a value when running a flow. Local variables are set in a process flow that calls a data flow in the flow properties. You can use a local variable, a variable known only to a particular procedure, as a passed parameter. 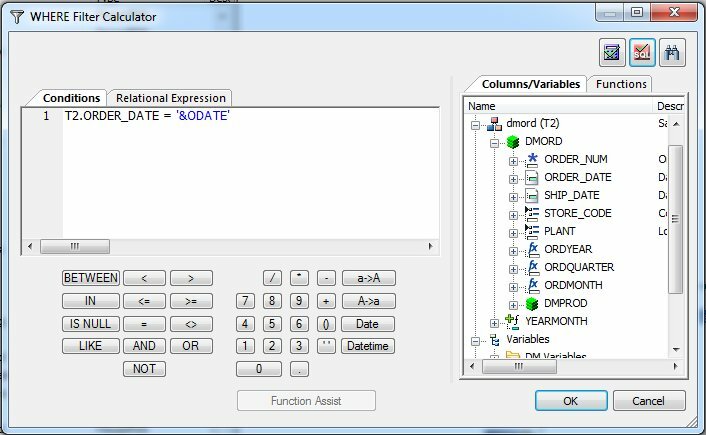 Type the variable name into an expression or condition in one of the calculators. The variable name must be enclosed in single quotes if it contains alphanumeric or data values, as shown in the following image. 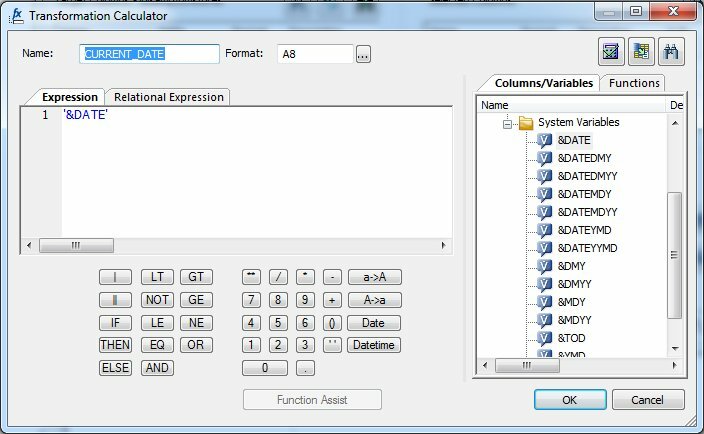 Open the expression in a calculator. Click the Test SQL Statement button. DataMigrator prompts you to enter a value for the variable. Note that when entering a date value, no quotes are required, and the date must be entered in the format used in a where condition, as shown in the following image. In the Process Flow tab, drag the Data Flow that uses the local variable into the workspace, to the right of the Start object. 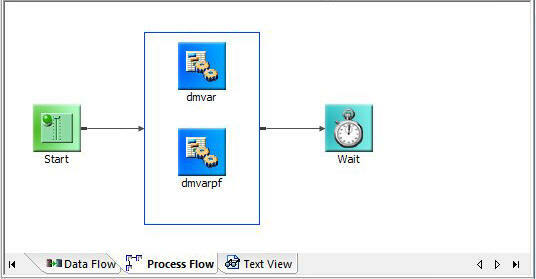 Double-click the Data Flow object (ibisamp/dmvar), or right-click the object and select Properties. Enter the value for the parameter, as shown in the following image. Note that you do not need to manually enter the parameter name and value. Clicking on the ellipsis button to the right will bring up a dialog box where you can enter values for the parameters. If you choose to enter a date value manually, no quotes are required, and the date must be entered in the format used in a where condition. Multiple parameters can be separated by commas. Also note that checking Run as Stored Procedure is not required. Save and run the flow. Drag the Data Flows that you want to run inside the Parallel Group. Double-click the data flow that requires a parameter, or right-click it and select Properties. Note that you do not need to manually enter the parameter name and value. Clicking on the ellipsis button to the right will bring up a dialog box where you can enter values for the parameters. If you choose to enter a date value manually, no quotes are required and the date must be entered in the format used in a where condition. Multiple parameters can be separated by commas. Alternatively, the value for the local variable can be a (global) variable set in a stored procedure, as shown in the following image.